Race five, our final duathlon of 2014 happened today with a turnout of 23 competitors under the watchful eyes of lead marshals Damian Donohoe, Brian Flynn and their team. It was a wet windy day where only the brave members of the club dared to compete. On the cycle course winds were constantly changing direction and this made for difficult cycling conditions. Today’s race was won by Ollie Kelly with a comfortable margin of 2 min and 8 seconds over Gary Brady. 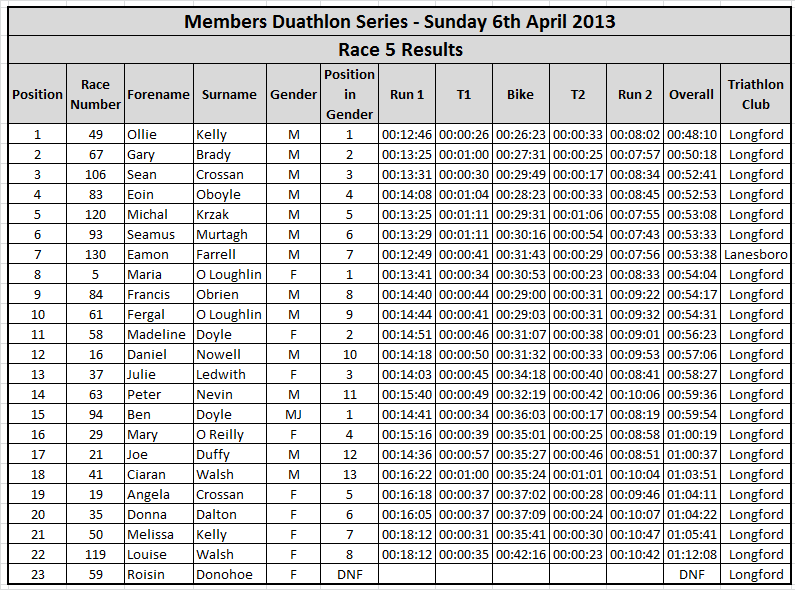 Female winner Maria O Loughlin had another good race today and re-affirmed her first place slot in a time of 54:04. Madeline Doyle who has been steadily improving over the last few weeks had a good race, putting in a great time of 56:23. It was great to see our first junior competitor Ben Doyle compete in today's race and putting in a huge effort to get across the finish line under the hour in a time of 59:54.